Have you ever wondered what it takes to create and implement a festival such as Amery Fall Festival? Not only does it take volunteers, but it also needs support of local businesses! 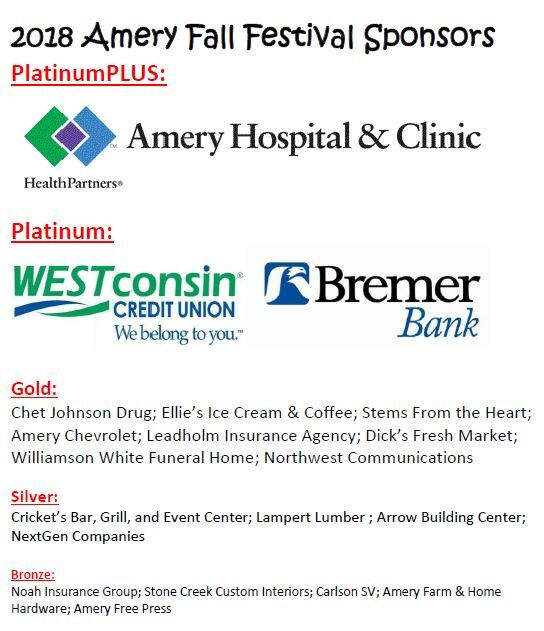 We’d like to extend an extra special THANK YOU to these 2018 Amery Fall Festival Sponsors! Their overwhelming support has made it possible for us to provide you so many free and/or affordable events to enjoy! They are an amazing group of business, owners, and employees that often provide both funding for the festival along with volunteers at various events ranging from serving beer to helping line-up the Grande Parade! Learn more about this year’s sponsors by clicking below! Better yet, shop at their businesses to show your support!